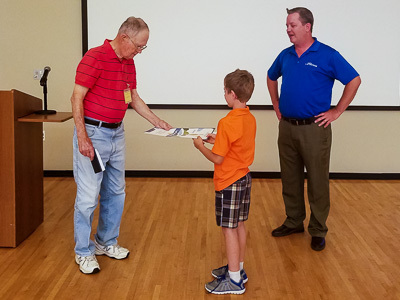 Congratulations to John Zoerb. 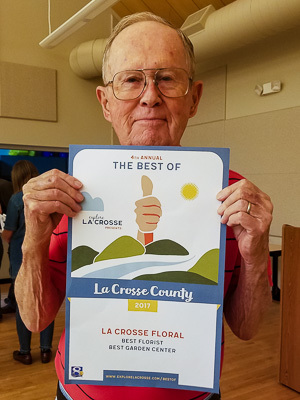 At our last meeting, he was presented with an award from Explore La Crosse for "Best Florist" and "Best Garden Center". Those of us who have attended the annual workshop there know just how great it is! The camera club summer picnic will be Tuesday, August 22, 2017 from 5-6:30 pm in Myrick Park at the main shelter. Please bring a dish to pass, your own plate, eating utensils and drink. The Competition schedule for 2017-18 is available. Continue reading to see the link for downloading a copy. The Projected categories are: Open, People, Nature and Creative. Three of the four categories are available for submissions each month. The Print category alternates each month between Black-and-White and Color prints. Challenge images are to have been taken after May 9, 2017.